I am getting ready to start this year's show season at the Fourth Level. I just got a gorgeous top hat for Christmas. 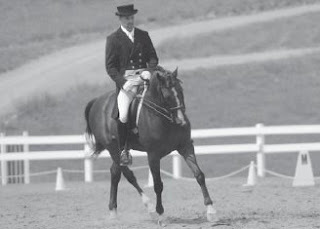 My trainer has always told me that when I can come down the centerline in the canter, it would be time for me to wear my top hat. When my husband learned that I would be showing Fourth level, he surprised me with this gift. So, now that I am ready and I have the hat, I have heard that I can no longer wear it in Fourth level. Is this true? Are there any other attire changes I should know about? According to the new rule, "while on horses competing in national level tests (Fourth Level and below), riders must wear protective headgear . . . at all times while mounted on the competition grounds . . . Protective headgear is a riding helmet which meets or exceeds ASTM (American Society for Testing and Materials)/SEI (Safety Equipment Institute) standard for equestrian use and carries the SEI tag. The harness must be secured and properly fitted. Any rider violating this rule at any time must immediately be prohibited from further riding until such headgear is properly in place." This new rule is one that was long in the making and it is a major change. It affects amateurs and professionals alike. The only riders it won't affect are those riding only at FEI levels. This means that from March forward, riders who prefer protective headgear will no longer have to worry that they are making a statement about the rideability of their horse when they wear a helmet, since everyone will now be wearing one. Those dressage riders who have not worn a helmet in a long time might be surprised at how much helmets have evolved in recent years. They come in many styles, are comfortable, cool and lightweight. Some even come with "bling." There are also a few other recent changes in the rules for proper attire. The rules state that in Fourth level and below "A short riding coat of conservative color . . . is mandatory." Proper conservative colors are: black, grey, navy or brown. A newer rule says that coats may have contrast coloring, and/or piping. For example a black coat with light pink collars would be acceptable, or a grey coat with black collars. A cutaway coat is also permitted – this is like a modified tailcoat. White or light colored breeches or jodhpurs, as well as a light, solid colored, or nearly solid colored shirt are also required. In extreme heat, if management allows competitors to show without jackets, riders need to have a long or short-sleeved shirt with a collar. The collar is important here, because when jackets are waived, neckwear is also waived. T-shirts are definitely forbidden. Solid colored cooling vests (vests with cold packs in them) are also legal, and they may be worn under a jacket, or simply over a shirt if jackets are waived. These vests have become very popular in warmer climates. When jackets are waived, you may also wear any other solid colored vest. In my opinion, white or black are good color choices for vests. Use your best judgment when you dress for a show. Conservative, neat and well-fitted is always a successful presentation. Any competitor at any time can look at the USEF website under "Rules for Dressage" to answer further questions about the dress code. I hope this helps you gear up for the 2011 show season. Wear your helmet for now and save your top hat for when you graduate to the PSG level. Of course, you may elect to wear your helmet at any FEI level up through Grand Prix. More and more upper level riders are. Good luck!